Canelo vs Chavez: Keys to Victory, Four to Explore, Official Prediction! For years, two of Mexico’s favorite son’s have been on a virtual collision course. Saturday night, those two stars will collide when Saul ‘Canelo’ Alvarez (48-1-1, 34KO’s) takes on the son of a legend eager to place his own print on the sport, Julio Cesar Chavez, Jr (50-2-1, 32KO’s). The entire country of Mexico appears torn between the two talents. Half leaning towards the famed Chavez family; the other half leaning towards the budding star. As these two warriors prepare for battle, we take a moment to analyze Keys to Victory, Four to Explore, and an Official Prediction. Keys to victory for Canelo will all center around a busy work ethic, and the type of conditioning that will allow him to preserve enough energy to be fresh deep into the night. Canelo’s combinations, underrated defense, and sharper-than-average punch selection make him a very tough out for anyone. But tonight, his opponent isn’t like any he’s faced to this point in his career. The one wildcard in Chavez Jr.’s arsenal is a level of toughness that will allow him to walk through the fire, knowing that if he absorb a few shots he can get close enough to land a few much harder. This makes for a very interesting night for Canelo. Questionable conditioning late in fights remain an underground concern for him. If Canelo can’t mount a strong enough attack early to close the show late, he could very well be the one in trouble down the stretch when Chavez Jr. gains strength. 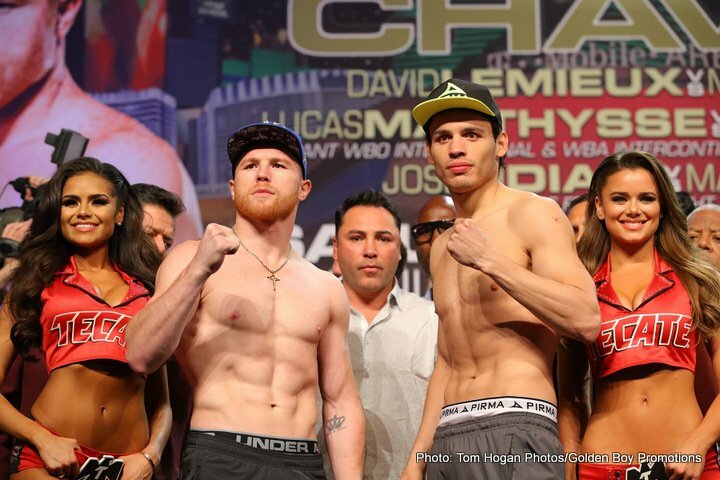 If Canelo can overwhelm Chavez Jr. early and stay fresh late, he’ll coast to a points decision with ease. 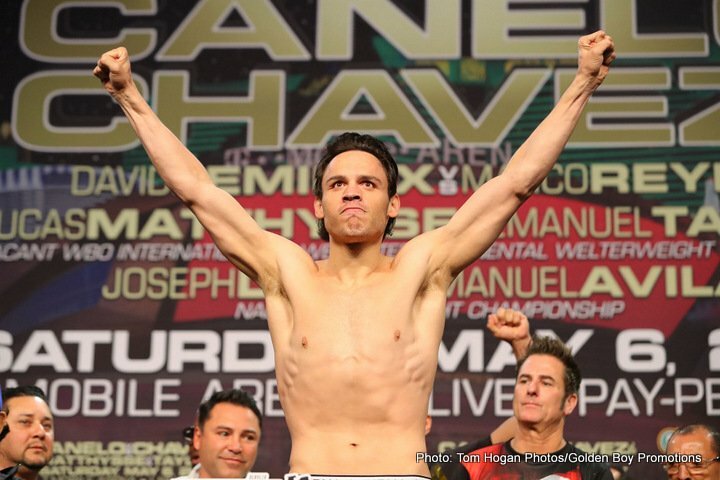 KEYS TO VICTORY – JULIO CESAR CHAVEZ JR.
Chavez Jr. enters the ring in perhaps the best shape we’ve ever seen him in. If it translates to energy down the stretch, he could be in for a huge night. Oddsmakers don’t seem to view him as a viable option to win, but with the work ethic he possess, the underrated power he packs, and a dynamic will to survive, know up front that his chances are much better than odds indicate. Chavez Jr. will need to start aggressive, and keep his pedal to the medal! Canelo wins the speed battle with ease. So Chavez Jr. can’t allow him to tee-off and pick his shots. 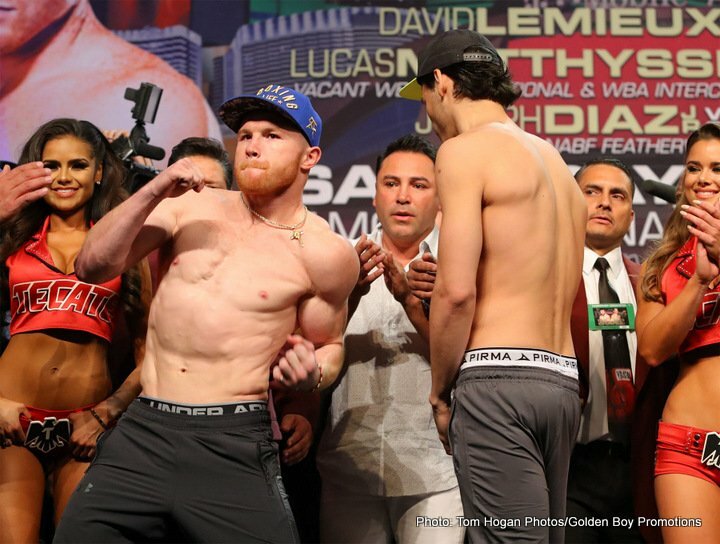 Chavez Jr.’s best shot will come if he can keep Canelo on his back foot. We’ve seen Canelo buzzed a few times at the hands of well placed powershots. If Chavez Jr. can earn his respect early and often, there’s no question he can alter the fight enough to have a chance on the cards and potentially shock the world! Size Matters? : A notable amount of Canelo’s career has been spent in the ring as a Jr. Middleweight, facing men who had no business going anywhere North of the Welterweight realm. While size typically serves as a chief benefit in the end, it was arguably the smallest natural welterweight he faced that gave him the most difficult time (Floyd Mayweather). After defeating that string of men whom he outweighed on fight night by a decent margin, the time has come for Canelo to enter the ring as the smaller talent once the bell rings. Despite both men weighing in at 164lbs, Chavez is expected to between 10-12lbs heavier than Canelo when the bell sounds on fight night. This comes in addition to an extra few inches vertically, and a 4 inch reach advantage horizontally. 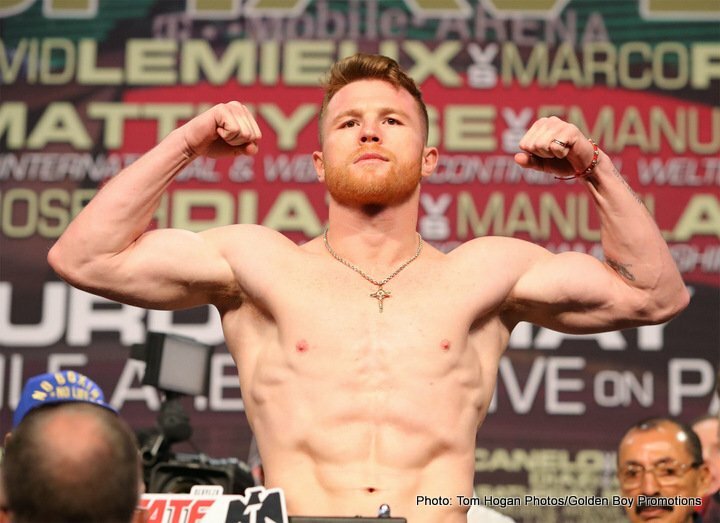 How will Canelo handle being on the short end of an advantage he has typically celebrated? Strength or Weakness? : Despite being five years younger, Canelo’s resume is loaded with a who’s who of proven, recognizable talent. From the likes of Shane Mosley, Miguel Cotto, Floyd Mayweather, and Erislandy Lara, seems Canelo has faced everyone you could ask of him between the Welterweight and Super Welterweight realm. Chavez Jr. is a bit older and hasn’t faced as many notable names, however, he’s been equally as victorious over a greater amount of time. With over 100 bouts and nearly 1000 rounds boxed between the two of them, is there truly a benefit to Canelo’s stronger list of competition? Or has the scenic route taken by Chavez Jr. allowed him to coast into this mega fight with enough gas left in the tank to peak at the right time? Sounds strange in theory; but Chavez Jr. looks better than he ever has and this is the biggest stage of his career. All indications say this could be the perfect storm to see an ending that breaks from the norm! Mis-Judge: Aside from the two men going to war and the ref that stands between them, (Kenny Bayless), there are three people who hold the key to the outcome of this epic clash. Those three people are Adelaide Byrd, Dave Moretti and Glen Feldman. The winner of this bout will inevitably land a clash against Gennady G. Golovkin. The world of Boxing has wanted a clash between Canelo and GGG for quite some time. But there’s also a strong contingent who feels a mega fight with the name “Chavez” attached to the billboard holds a great deal of power as well. Truth is, although Canelo is the bigger talent right now, there’s a lot of money to be made for whichever talent (between the two) finds a way to get the “W”. That said, which fighter is more apt to get the benefit of the doubt in those close fought rounds between the two judges? The term “mis” means “badly” or “wrongly”. Could boxing be on the brink of another ‘mis-judgement’? Meltdown? : Inactivity and a limited desire to conform to the life of an athlete has led to Chavez jr. being forced to fight between the Super Middleweight/Light Heavyweight range when he probably wasn’t the best fit for it. Along came an opportunity to face his country based nemesis, and suddenly, Chavez Jr. found a way to melt away the weight he never seemed to be able to shake in the recent days. It’s been quite some time since Chavez tipped the scales looking this svelte. Does it produce the burst of energy he’ll need to win? Or an overinflated has-been who’s reached the end? Contrary to popular belief, this clash could very well end with Fight of the Year honors bestowed upon by the end of the night. Anytime you have two proud Mexican warriors waging war for the country’s highest prize, all bets are off, as the oddsmakers won’t have a clue! While Canelo enters the ring as the projected favorite, it wouldn’t be a far stretch to believe we could see him tested tonight unlike we’ve ever seen before. His speedy combinations and snapping uppercuts won’t fail to impress; but it’s those lulls in action that will make for smooth transitions into a rugged brawl fest when Chavez Jr. gets aggressive and steps on the gas. Fight fans can expect a ton of ebbs and flows with a few surprising moments as Canelo is reminded that he’s human. In the end, despite the turbulent moments, expect Canelo to rack up enough points to earn a hard fought victory. 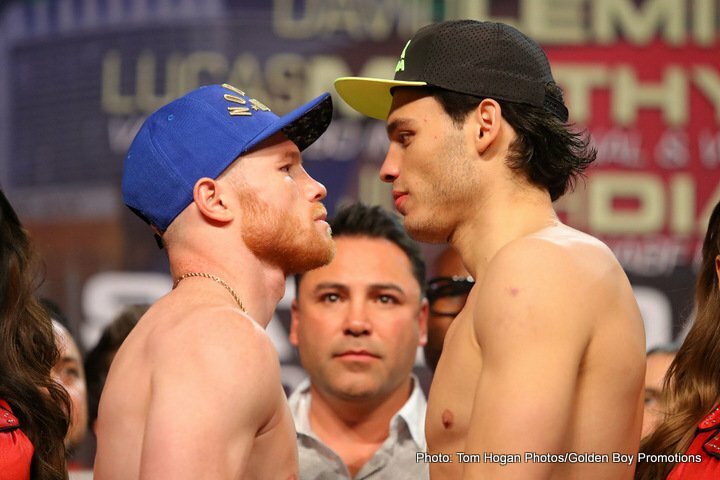 Previous boxing news: Canelo vs. Chavez Jr.: Will The Fight Match Late Buzz? You are here: Home / Boxing News / Canelo vs Chavez: Keys to Victory, Four to Explore, Official Prediction!